Create your ideal palette with the all new FAB makeup. 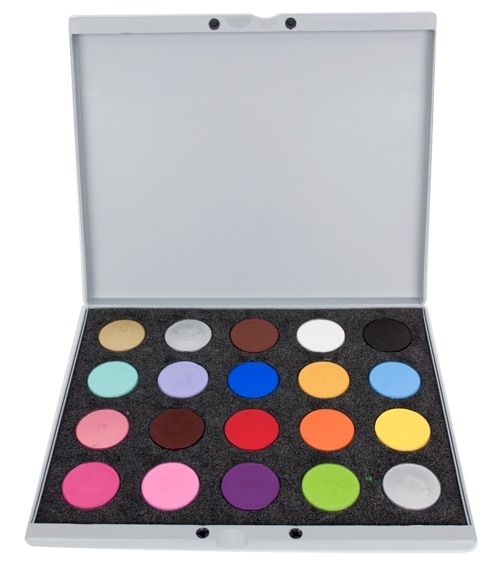 You choose 20 of your favourite colours including your choice of Shimmers, Metallic and sparkle colors. The new FAB line presented by SuperStar is a water based face and body make up that is easy to use because of its creamy consistency, and bold colors. FAB paints remove easily with soap and water and are ideal for face and body art because they do not crack and dry in under 2 minutes. The 20 color Build Your Own Palette (BYOP) features (20) 16gm FAB paints of your choice; This is enough paint to paint over 1,000 faces. Each container has a clear lid making it easy to find colors and keep your set up looking pristine and professional. This palette includes a beautiful custom FAB Case that looks like a laptop with the FAB logo on the cover. To Use: Damped brush or sponge and rub over the surface of the FAB paints until you build up a smooth creamy consistency then apply to the skin. After choosing your colors please review cart to ensure colors are selected correctly. Palette dimensions: 12 ¾ inches wide x 10 ¼ inches long x 1 ¼ high. Choose 20 of your favourite colours! Copyright © 2013 The Magic Mirror. All Rights Reserved.